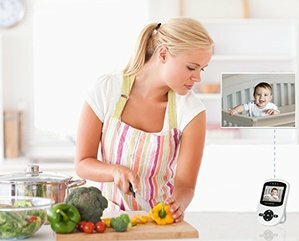 If you have recently become a parent or maybe you're about to become one, and you're trying to figure out all the important stuff you need to acquire to make sure that your baby grows in a safe and secure environment, one item you might want to consider is a baby video monitoring system that will allow you to remotely watch and listen to your baby. In a nut shell, a camera on the baby side, a screen on the monitoring parent side, and wireless communications between the two sides make up these systems. You can either choose to watch your baby continuously, or you can watch only when the monitor alerts you that the baby is crying (or that there is some noise around the baby), by starting automatically showing you what is happening. Equipped with 2.4GHz FHSS technology for sound clarity, the best baby video monitoring systems you can buy nowadays will make you feel at peace with the knowledge that your little one will come through loud and clear when he or she needs you. And most of these baby monitors allow you to talk back to your baby too. Depending on the brand and model, baby video monitoring systems come with different sets of features. Some of these are essential, others not as much. 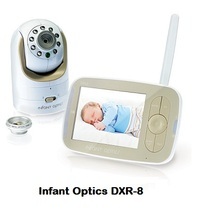 We will compare here three baby video monitoring systems that were the most popular among Amazon customers at the time this article was written, so that you may select the best product that will correspond to your family's needs. Note that these systems can also be very useful for monitoring people suffering from disabilities due to sickness or old age. 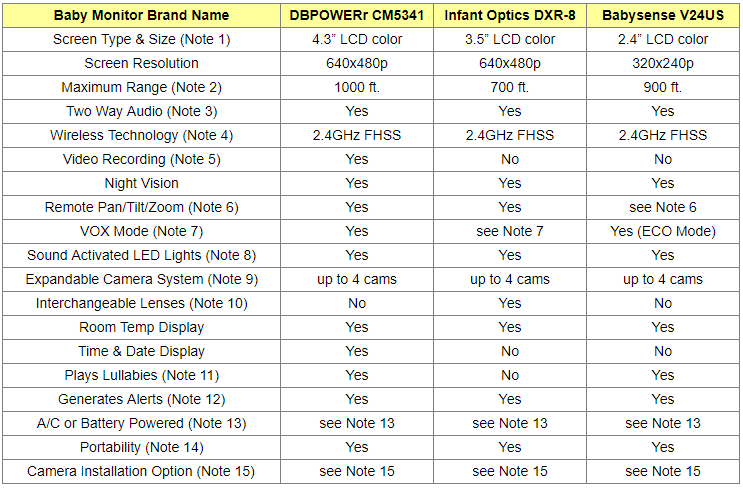 This article will compare DBPOWER CM5341, Infant Optics DXR-8 and Babysense V24US baby video cameras. These were not just the most popular among Amazon customers at the time this article was written, but they have also received excellent reviews from most Amazon buyers (no less than 4 stars out of 5 stars). LCD stands for Liquid Crystal Display and uses the light-modulating properties of liquid crystals which do not emit light directly, but instead, use a backlight or reflector to produce images in color. Small LCD screens are common in portable consumer devices such as digital cameras, calculators, watches, smartphones, etc. Range is the maximum distance within which the camera and the monitor can still maintain contact. It can be affected by the number and thickness of the walls the signal has to go through as well as by other electronic systems that may exist around the monitor and the camera. So, the numbers given here are approximative. To provide this feature, the camera and the monitor are equipped with built-in microphones and speakers. All three cameras are designed to deliver acceptable quality video and audio. They feature a secure FHSS (Frequency Hopping Spread Spectrum) 2.4GHz connection between the camera and monitor unit. The 2.4GHz FHSS technology provides a much more reliable wireless connection over previous cordless technologies (such as 900MHz cordless antennas). That means better range and practically no chance of missing important events in your baby's room due to a weak or dropped signal. Note also that FHSS technology 100% locks your digital privacy and provides stable streaming as well as a secure and interference-free connection. You can rest assured that no one else is viewing your video or audio feed. Also, normally, these camera systems should not interfere with other household wireless systems. That is because the Frequency Hopping (FHSS) technology switches to different channels automatically to avoid interference. This feature is only available with the DBPOWER monitor. It allows manual video recording as well as automatic video recording with precise sound-triggered DVR function. The system supports micro SD cards up to 32GB (not included). With this feature, the monitor provides the appropriate controls to remotely pan and tilt the camera. Note that while with the DBPOWER and Infant Optics monitors, you actually pan & tilt remotely the camera physically, with the Babysense monitor, you zoom in and pan & tilt remotely the image, but not the camera itself. The Babysense monitor doesn't have a feature that allows the camera to be remotely physically panned and tilted; that can only be done manually. With DBPOWER, when the VOX mode feature is turned on, the monitor screen and sound will turn OFF after the sound level around the camera drops below a selected sound sensitivity level and remain in standby mode. The screen and sound will turn back on as soon as the camera detects some sound above the selected sensitivity level around the baby. The system allows you to choose either High or Low sensitivity settings for the VOX function, so there is a possibility to adjust how sensitive you want the system to be before reactivating transmission of sound and video. With Infant Optics DXR-8, there is no VOX mode per say, but there is a SLEEP mode, where the monitor screen will turn OFF after a pre-set time delay. The time delay can be set in the menu options. Note that in SLEEP mode, the sound stays ON all the time, but the screen is not activated when noise is detected. However, you can simply press a button on the monitor to reactivate the screen. With Babysense, the VOX mode is referred to as the ECO mode. With the ECO mode feature turned on, the monitor screen and sound will turn OFF after the sound level around the camera drops below a selected sound sensitivity level and remain in standby mode. The screen and sound will turn back on as soon as the camera detects some sound above the selected sound sensitivity level around the baby. - ECO-LOW means low sensitivity level, requiring higher sound level to reactivate the transmission. - ECO-MID means medium sensitivity level, requiring medium sound level to reactivate the transmission. - ECO-HIGH means high sensitivity level, requiring low sound level to reactivate the transmission. ​Sound activated LEDs that light up when there is sound allow you to “see” the sound of your baby’s voice alerting you if he/she is crying out when you have the volume turned down. To adapt to growing families, all three baby video monitoring systems can support simultaneously up to 4 cameras, and all three monitors feature a scan mode which automatically cycles through the cameras at about 10-12 seconds intervals, providing continuous video and audio surveillance on multiple cameras. Note that the DBPOWER monitor also supports split-screen display. With pre-programmed lullabies, the DBPOWER and Babysense cameras can sing to your baby to sleep at any time. The DBPOWER monitor generates low battery, out of range and low/high temperature alerts. 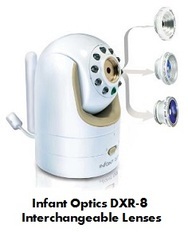 The Infant Optics monitor generates low battery and poor connection alerts. The Babysense monitor generates low battery, poor connection, high/low temperature alerts. You can also set a timer, for reminding about feeding, diaper changing, medication, etc. ​The cameras of all three baby video monitoring systems considered here can be powered using the provided A/C power adapter. The monitors of all three baby video monitoring systems are equipped with rechargeable batteries. An A/C charger is included. Since all three monitors considered here have an internal battery, they are portable and can be taken anywhere around the house while you are working, cooking or doing anything else. All three cameras considered here can either be placed on a table or wall-mounted. ​DBPOWER comes with a "mounting" shelf that allows you even to mount it on the ceiling for a better view, if desired. So which baby video monitoring system to get? Note also that, with 1000ft, DBPOWER also provides a bigger range than the other two monitors considered here for camera and monitor communications. On the other hand, Infant Optics is the only one of the three monitors with interchangeable lens technology. Three separate lens types (Normal, Wide Angle, and Zoom) allow you to choose the most suitable focal length and viewing angle for the specific environment, just like with a professional camera system. Finally, with Babysense you can program more alerts and alarms than the other two monitors considered here. In particular, you can set up alerts for feeding, medicine taking and diaper changing. Also, Babysense and DBPOWER are the only ones that support lullabies and that can display time and date. For price information on these three baby video monitors, or to purchase, please see the next section. The above three compared baby video monitors are available on Amazon. Wi-Fi support: Accessible and controllable from anywhere using your smartphone. 1080p HD Video Quality: View live or recorded videos in excellent detail and rich color, from anywhere in the world. Advanced Night Vision: Near-invisible infrared LEDs let you see your baby clearly even in total darkness. 2-Way Wireless Talk: Comfort and talk to your baby from anywhere, whether you’re at the office or in the living room. Instant Smart Alerts: Get motion, sound, and air quality notifications sent to your smartphone. Smart Nursery Features: Multi-colored night light, lullaby player, temperature, humidity & VOC air sensors. Monitor and control all features anytime from your smartphone​. Works with Amazon Alexa, Apple HomeKit, Google Assistant, IFTTT: View your live video with a simple voice command and easily integrate Arlo Baby into your smart home.